Also: Abbot downplays Indonesian refugee plans. Friday ASEAN links. Thailand’s Public Health Minister, Pradit Sintawanarong, said that the short stature of Thai teenagers can be attributed to not drinking enough milk. 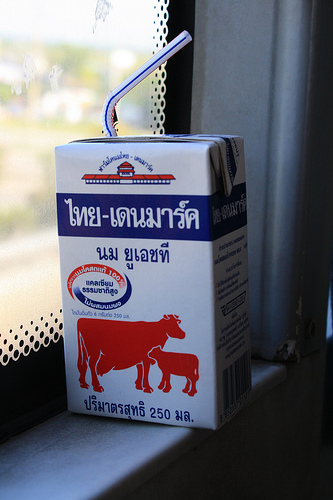 “Thai people consume less milk than other Southeast Asian countries, with Thais drinking about 14 liters of milk per head each year, compared to Southeast Asia's average of 60 liters and the world rate of 103.9 liters annually,” reported The Bangkok Post. A study by the health ministry revealed that the average height of 18 and 19-year-old boys was 167.1 cm, with girls of the same age averaging 157.4 cm. A new campaign by the ministry promotes breastfeeding babies for at least the first six months after birth, as well as encouraging young children to drink two or three glasses of milk each day. A very different campaign being undertaken by newly minted Australian Prime Minister Tony Abbott is making waves in Indonesia. He faces growing criticism from Jakarta over a controversial new policy that will see the Aussie military turn boats filled with refugees back to Indonesia. “The plan, Operation Sovereign Borders, has rankled Indonesia, with Foreign Minister Marty Natalegawa telling his Australian counterpart Julie Bishop on the sidelines of the UN this week that Jakarta ‘cannot accept any Australian policy that would, in nature, violate sovereignty’,” said Channel NewsAsia. Operation Sovereign Borders will also include buying fishing boats to keep them away from smugglers, placing undercover Aussie police in Indonesian villages, and compensating locals for intelligence. Abbott downplayed Natalegawa’s concerns, saying that he isn’t “forcing anyone,” but hoping for cooperation from Jakarta. Approximately 1,300 asylum seekers from Indonesia arrived in Australia between January and June of this year. Over in Malaysia law enforcement officials with the Domestic Trade, Cooperatives, and Consumerism Ministry were threatened with machetes, daggers, and samurai swords during a raid on a bootleg video compact disc (VCD) warehouse. Out of fear for their own lives, the officers were forced to let the seven criminals go. Police later re-arrested four of them. “6,916 pirated VCDs, including the latest movies such as Adnan Sempit, KL Zombie and Iron Man 3, worth 70,000 RM ($22,000), were seized in the raid,” stated The Star.